Something went wrong. Try asking again. Thank you for submitting a question! 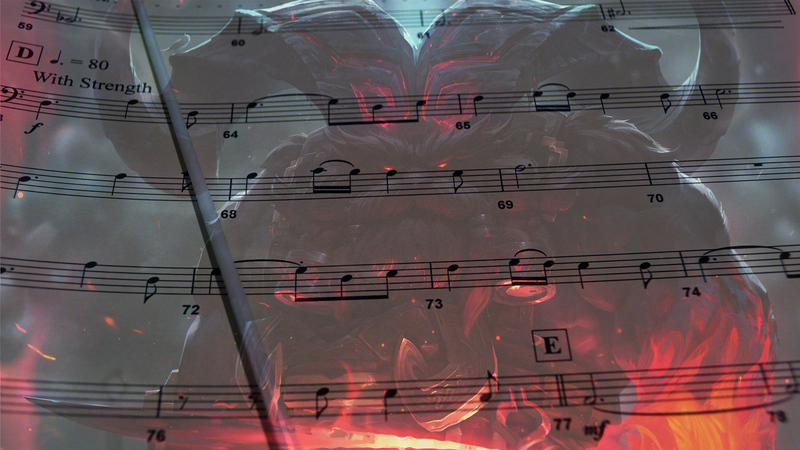 New sheet music, humming, and a behind-the-scenes video about creating Ornn’s music. Talondor here, composer on League of Legends and reigning Dungeon Master of the Riot Music team! Today we’d like to talk to you all about something that holds musical significance to all of us and is featured throughout much of League’s music… lyrical melodies. Not all champions, skins, or events call for easily singable melodies—sometimes it’s better to focus on something rhythmically strong, timbrely aggressive, or harmonically rich. For example, if something needs to evoke emotions of fear or uneasiness, then leaning into musical ideas that feel unfamiliar to most people might be the best option. However, a good majority of the time having an easily identifiable and singable melody is the best choice for representing someone or something, especially if the goal is to help it feel more relatable or human. It’s a bit odd, but if you can imagine a champion singing their theme and you can also sing along, then in a way, it helps you connect with that champion. Today we’d like to highlight what we believe are four of the most melodically lyrical yet individually unique pieces we’ve written for League: the champion themes for Taric, Taliyah, Ornn, and Irelia. Before we get to the sheet music (and a special behind-the-scenes video! ), let’s talk a bit about what we take into consideration when composing lyrical melodies. If you’ve listened to the theme songs for Taric, Taliyah, Ornn, or Irelia, you might be able to sing (or hum!) the tunes right now. Yet while all of these songs are singable, each one sounds pretty different from the others—why is that? Part of the reason is that each champion’s personality varies greatly, and the regions in which they live in Runeterra are all different too. The way Bilgewater sounds paints a certain set of musical expectations on a melody for a champion, just as it would for a champion from the Freljord, Shadow Isles, and so on. However, the degree to which it imposes these regional tendencies varies, as it might not be a priority in what we need to express with the music. In some situations, it may be appropriate to use the colors from specific instruments that feel inherent to a particular place in Runeterra, but then have the melody evoke something polar opposite to the emotion you may tie to that region. For example, Kayn’s music has moments where it uses instrumental colors to invoke Ionian influence, but the message they represent is presented in an ominous and menacing way that, while it represents Kayn well, sits counter to Ionian ideals like beautiful harmony and balance. Another reason these lyrical melodies can sound quite different is because each piece is composed by a different person on the music team. This affects the melody because our individual artistic tendencies color everything we write. For example, the fact that ShreddyMercury (appropriately named) shreds on guitar while Chemicalseb is way more proficient in piano absolutely colors their respective musical intuitions and informs the way they approach melody. To make sure we’re making the best music we can for a champion (or skin, or event), we all share ideas and give feedback on music throughout the process. This is critical in not only gathering new ideas, but helps confirm our thoughts on what works, what doesn’t, and what resonates across different people. While we all tend to write music through an instrument (like a guitar or piano), there’s another way that’s perhaps the most simple-yet-effective method of all: using your voice. It’s the instrument we all have and can use (you may have even used it earlier in this article!). Writing with your voice allows you to confirm that the melody is not only singable for the vocalist of the song, but also that it has the potential for other people to sing it, which in turn hopefully makes it more memorable. However, you don’t always have to sing aloud to make a lyrical melody. Sometimes all you need to do is hum. In Ornn’s case, humming was the spark that ignited the Fire Beneath the Mountain, and in the video below, you can join us as we work to forge a song fit for the Freljordian demigod! 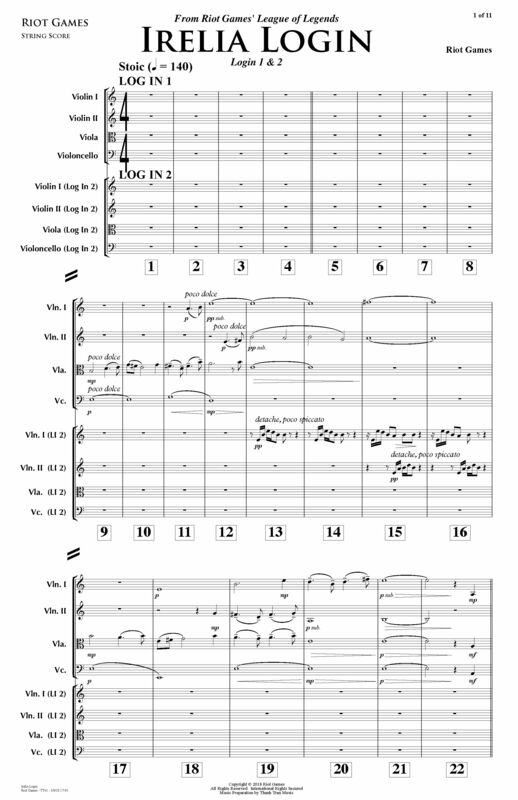 We hope you enjoy browsing the music of Ornn and the other melodic scores below. As a heads up, they may contain shorthand, errors, or ideas that were eventually cut or changed because they’re the raw scores used at the recording session. 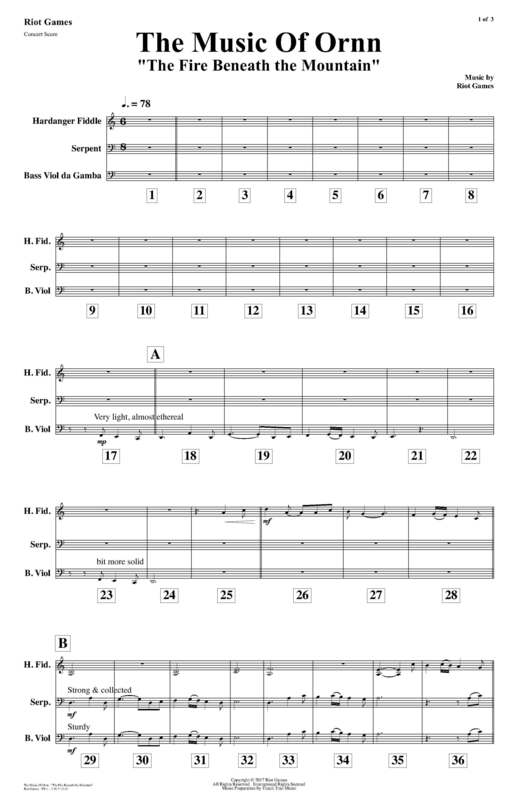 Also, if you’re looking for more sheet music, there’s more to be found in our previous post and our first post. Happy playing! Part of Ornn’s charm is that he hums a bit out of tune when he’s forging, but we thought, “Wouldn’t it be cool if it was based off an actual song?” Enter the Ancient Freljordian folk tune, “The Path to Hearth-Home.” It all started with a short story (not-released) about a young girl trying to find Ornn, which directly inspired the lyrics. 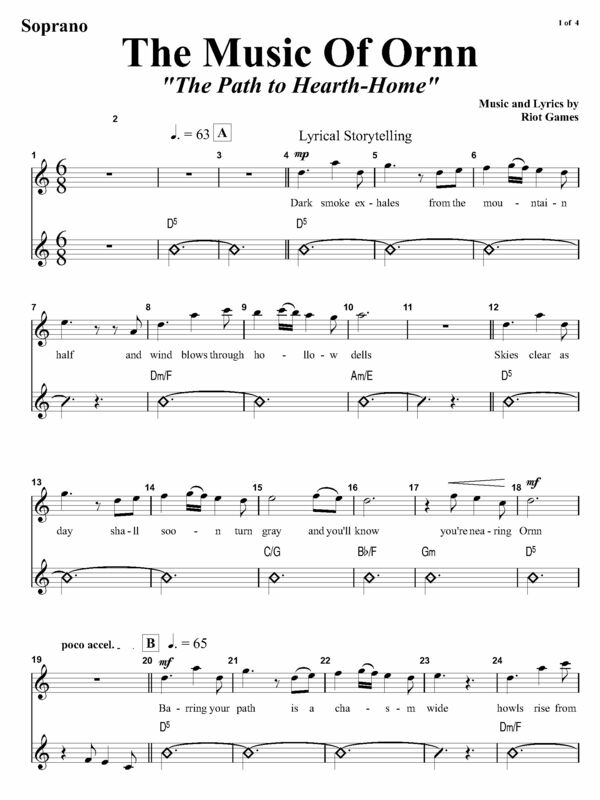 The lyrics not only tell a story of various locations in the Freljord, but give instructions on how someone might find the long-lost Mountainsmith. So, when Ornn is humming in-game while forging, he’s actually referencing fragments of the melody to an Ancient Freljordian folk song written about how to find him within his Hearth-Home. Watch “The Music of Ornn” video above if you’re interested in learning more! As mentioned in “The Music of Ornn” video above, part of the reason we translated the lyrics for “The Path to Hearth-Home” into Ancient Freljordian was so that it’d be accessible across all regions. However, we also realized that the song itself didn’t match the intensity of Ornn’s splash art, even if it fit his inner “softness.” So we took the melody of the folk song to create a new arrangement that more accurately matched the weight and intensity of his splash art. When all was said and done, we hoped that players would hear the musical cohesiveness across all of Ornn’s music—from the anvil-pounding login piece, to the Ancient Freljordian folk song, to his humming in-game while forging one of his masterpieces. As someone who has mained Irelia for several years, I was thrilled to get the chance to work on the music for her rework. I could tell from the concept art for her movement studies that the “blade dancer” aspect of Irelia was going to be front and center in her VGU. Elegance and fluidity needed to play a larger part in her music than what I would have composed for the older champion. I needed instruments that could express this, but that were also capable of being very agile and aggressive, so I settled on recording a string quartet. It wouldn’t be unreasonable to think of a string quartet as having a fairly docile sound, but at the more extreme dynamic ranges it can produce some of the most ferocious sounds I’ve heard out of any acoustic instrument ensemble. 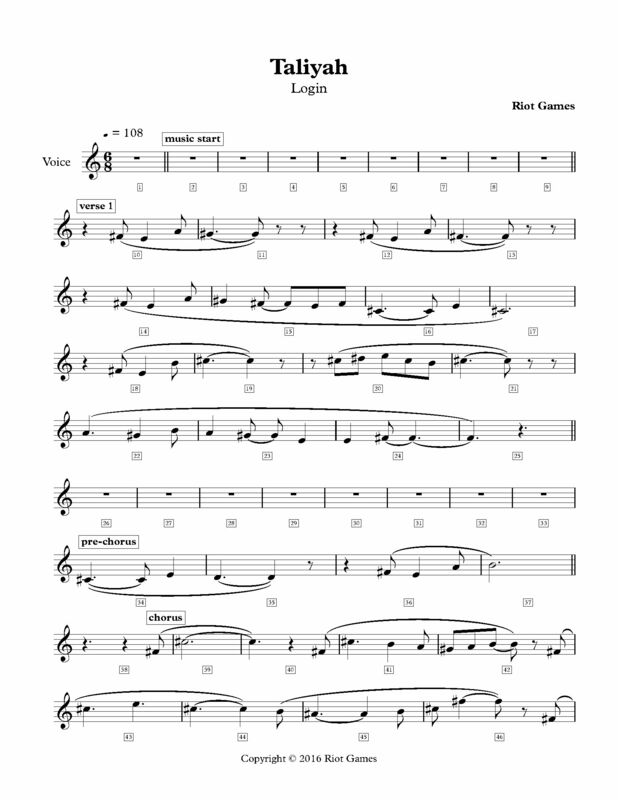 I expanded the writing and organized the parts into a double quartet to be recorded in two passes, one with lyrical melodies and the other with relentless 16th note rhythmic lines. The main melody is very symmetrical, with a rising motion in the first four bars, mirrored in the second four bars with a line that’s rhythmically identical but moves in a descending motion. Having a main melody that felt very balanced and “in-control” felt appropriate for Irelia and Ionia, and it also gave me a lot of room to play around it and against it with the surrounding rhythmic writing. The other quartet’s rhythmic passages are meant to have an almost perpetual-motion quality, facilitated by giving individual string players fast lines that are staggered with one another, dovetailed to make the sense of propulsion constant while being playable. I thought this combination of flowy melodies and motor rhythms, particularly during strident moments, seemed fitting for portraying Irelia as the “Blade Dancer”—a champion whose motions are fluid, beautiful, and absolutely lethal. The initial instrumental ideas for Taliyah’s theme revolved around building textures representing the sense of serenity that Taliyah could feel while traveling across the vast Shuriman landscape. These included percussive grooves made up of hand drums, rocks, and serene-esque chord progressions. While these textures represented the landscape nicely, it quickly became evident that a female voice would best portray and carry her personality, her motivations, and the journey that she’s on. We started with a short mockup of the first verse using a vocal sample library, but we knew we’d have to record a test pass with the singer as well. This helps us to know if the direction for the vocals works for the whole piece, see what range would be appropriate for the singer, and find the kind of tone we could utilize for the rest of the piece. Once we had the initial test recording mixed in, we finished the rest of the composition by chopping the initial recording and rearranging, pitching, and manipulating it to create the rest of the melodies. This was really valuable because it gave us a much more accurate portrayal of what the entire piece would sound like tone-wise, instead of moving back and forth between the singer’s voice and a sample library. This technique could have been difficult to pull off, but not having lyrics made it much more feasible. At the end, we had a final recording session for the new parts, which were easy to “plug in” after already having mixed the voice during the composing phase. The publishing and champion teams were working on instilling a strong superhero vibe into Taric’s rework. They suggested a musical direction which revived some great childhood memories of listening to 80s and 90s action scores. That vernacular runs through my blood, so when a live recording of this piece was greenlit, I was eager to write. I wrote Taric’s music for a live ensemble that I designed, which was more or less based on a traditional recording symphony orchestra. There’s a difference in how one writes for samples vs. live, especially when it comes to brass. For instance, the sound of close-voiced triads in the trombones just under middle C is one of the most beautiful textures of a live brass ensemble, which simply doesn’t translate well into samples. When using voicing chords, there’s a really pleasing harmonic richness when opening up towards the top of the range with trumpets that sound aggressive with samples. 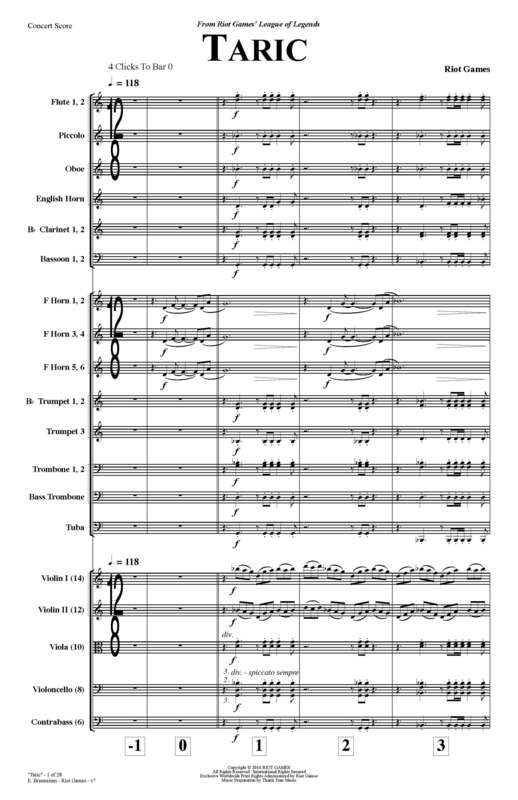 Most of League’s music is based on some form of orchestral ensemble combination, but because we try to stay original and fresh in our palette choices, we rarely get a chance to write for a full traditional orchestra (which is a real treat). In my opinion, writing heroic themes is always a challenge: How do you balance the desire to offer something new within all the tropes of the genre? How do you balance delivering a soaring sound and providing rhythmic muscle? For Taric, melody was my top priority. With his theme, I attempted to convey his strength, hubris and… a certain maturity that came to him after he ascended Mount Targon. By contrast, the B section of the piece is more relaxed and even suave. That attention to melody carried over to the middle section, where I made sure every line would have the proper arc to it. This completed the musical depiction of Taric, a more mature expression of strength and spirituality, without losing the charm and character that made him popular in the first place. Talondor is a composer on League of Legends. When he’s not re-rolling in ARAMs, he’s rolling d20s.